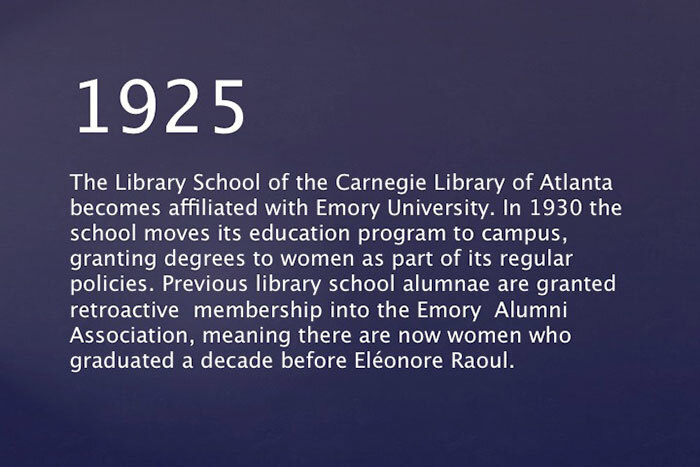 A century after Eléonore Raoul was admitted to Emory’s School of Law, becoming one of the university's first female graduates, Emory commemorates the lives of women who have trail-blazed, made an impact and broken barriers for education and equality. Cox Hall Ballroom, 6-9 p.m. The Center for Women and the Emory Alumni Association honor alumnae, current students, faculty and staff for their dedication to issues that affect women at Emory. Former Georgia Supreme Court Chief Justice Leah Ward Sears 80L, an Emory trustee, delivers the keynote address; President Claire E. Sterk offers remarks. Registration has closed. Woodruff Library, Jones Room 6:30-7:30 p.m.
Stuart A. Rose Manuscript, Archives and Rare Book Library, 7:30 p.m.
President Sterk offers remarks before a panel discussion focused on the ways higher education has empowered women, why women’s history and voices matter, and what the future holds. Crystal Edmondson 05C, an Emory trustee and Atlanta Business Journal broadcast editor, moderates. Panelists include alumna Chandra Stephens-Albright, executive director of C5 Georgia Youth Foundation; Martha Fineman, Robert W. Woodruff Professor of Law; and Jalyn Radziminski, an Emory student leader and 1915 Scholar. Register here. 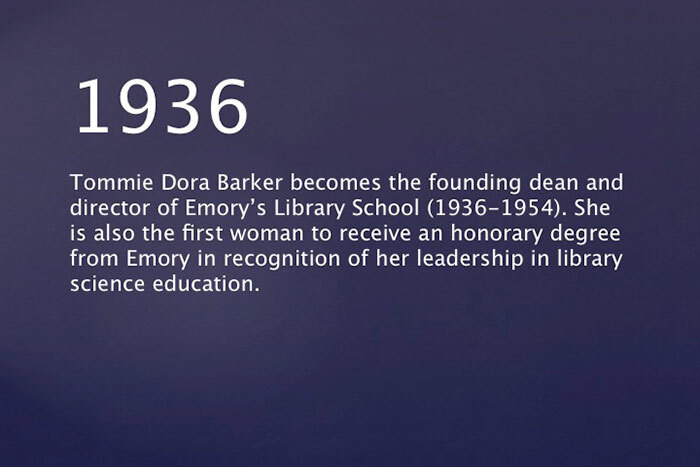 Following the discussion, guests are invited to a reception in the Rose Library and a viewing of "100 Years of Women at Emory: Progress Marked by Many Milestones.” The exhibit is on view in the Rose Library until April 21. 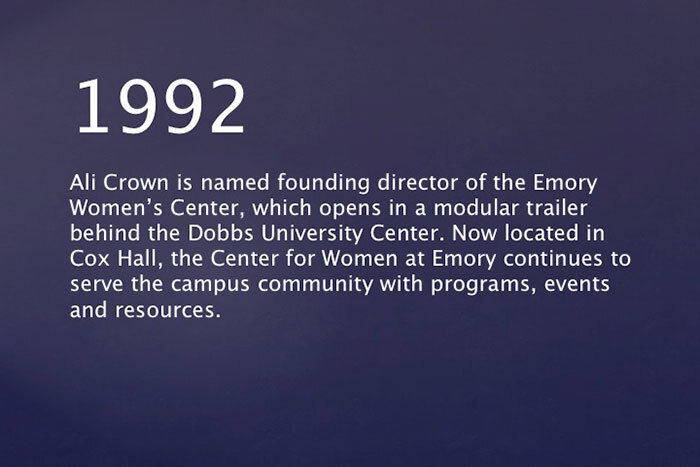 Events set for later this year include an oral history project to be featured on the Center for Women at Emory website and a celebration marking the center’s 25th anniversary, scheduled for Oct. 18. When Eléonore Raoul arrived to enroll in Emory University’s newly opened Lamar School of Law in 1917, she was not only challenging convention, she was quietly changing history. A suffragist and community organizer from a prominent Atlanta family, 29-year-old Raoul was already a street-savvy social activist who had no problem taking a stand for a good cause. She had studied at the University of Chicago, chaired the Fulton and DeKalb counties' chapter of the Equal Suffrage Party of Georgia, and served as a field organizer in New York and West Virginia, venturing up and down rutted mountain roads to urge the wives of coal miners to demand the right to vote. A few years earlier, the plucky Southern debutante had even served as grand marshal of Georgia’s first suffrage parade, riding a white horse down Peachtree Street to lead hundreds of women in support of the 19th amendment – thought to be the first event of its kind in the American South. In later interviews, Raoul recalled the day that she walked from her mother’s home on Lullwater Road to Emory’s fledgling law school — today’s Carlos Hall — to talk with Emory trustee and acting Law School Dean William Danner Thomson about the possibility of admission. It was a bold request. Historically, Emory was in the business of educating young men. And Chancellor Bishop Warren Candler had made no secret of the fact that he vigorously opposed coeducation. As it happened, her inquiry coincided with Candler’s absence from campus — a sly maneuver that was no accident. Raoul described how her application had been expedited by a phone call from a friend, alerting her that, “The bishop is away. Get out to Emory quickly and pay your fees,” she recalled in a 1977 Emory Wheel interview. The new law school had just opened its doors a year earlier, and in 1917 Raoul was permitted to join a modest entering class of three students — a number starkly depleted by World War I enlistments. Once enrolled, she was allowed to stay. Raoul graduated in 1920 — the same year that Congress ratified the 19th amendment granting women the right to vote. But her presence drew both scrutiny and consternation. 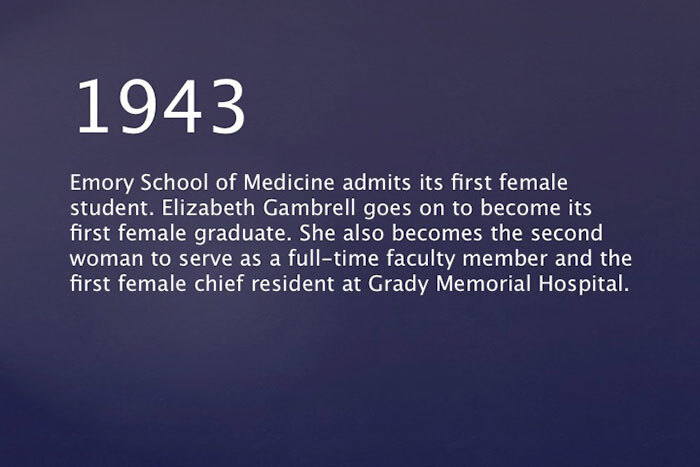 The year after she applied for admission, the Emory Board of Trustees took quick steps to make sure it wouldn’t happen again, making an official statement prohibiting women from entering the schools of law and medicine. 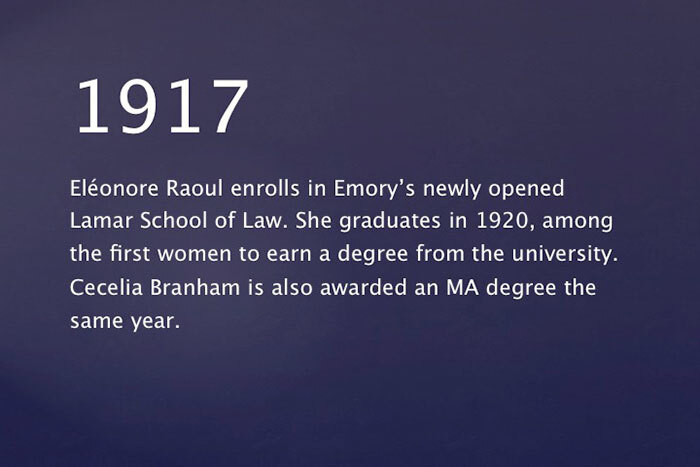 It’s been 100 years since Raoul was admitted to Emory’s School of Law, and she is considered among the first female scholars to earn an academic degree from the university. Through her challenge, Raoul had loosened a longstanding tradition, triggering decades of halting progress as the university joined private schools across the nation grappling with the question of educating women. This year, the university celebrates the lives of the women at Emory who have trail-blazed, made an impact and broken barriers for the past 100 years with a series of special events, including a March 18 awards ceremony hosted by Emory’s Center for Women and the Emory Alumni Association and an April 5 panel discussion in Woodruff Library. 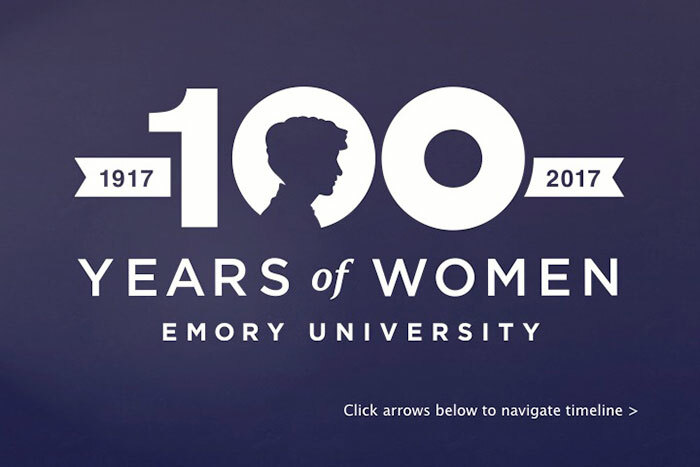 The celebration also includes “100 Years of Women at Emory: Many Milestones of Progress,” a new exhibit in the Stuart A. Rose Manuscript, Archives and Rare Book Library. Curated by University Archivist John Bence, the exhibit illustrates decades of hurdles and progress, fueled by advocacy, activism and sheer persistence. The exhibit reflects a complex and sometimes jumbled history, filled with hesitant starts and stops, pioneering achievements and curious contradictions, acknowledges Bence. It wasn’t always a smooth relationship, he says. But in the end, women simply found a way to study here — whether their presence was officially condoned, or not. 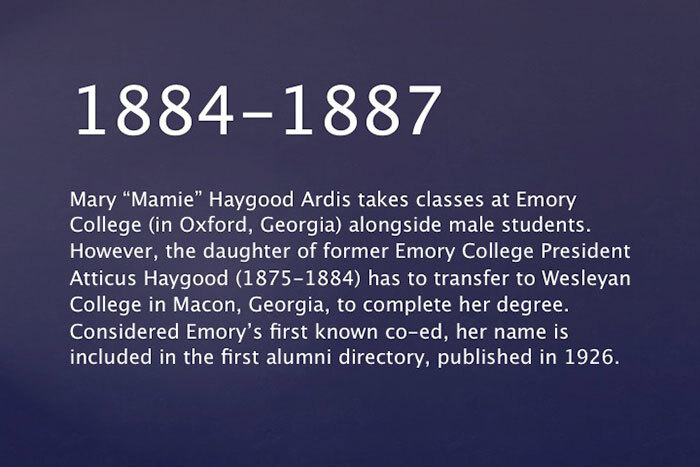 Consider Mary “Mamie” Haygood Ardis, the first woman known to have taken classes at Emory’s original campus in Oxford, Georgia. Records show the daughter of former Emory College President Atticus G. Haygood (1875-1884) was permitted to take classes alongside her male peers for three years, from 1884-1887, but then had to transfer to Wesleyan, an all-women’s college in Macon, Georgia, for her final year of studies. 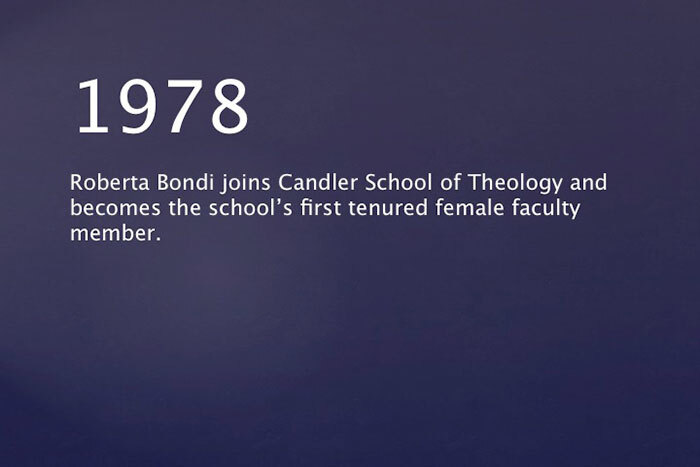 She would go on to marry a classmate from Emory, Julian Ardis, and was eventually counted as an Emory alumna, her name included in the university’s first-ever alumni directory in 1920, Bence notes. 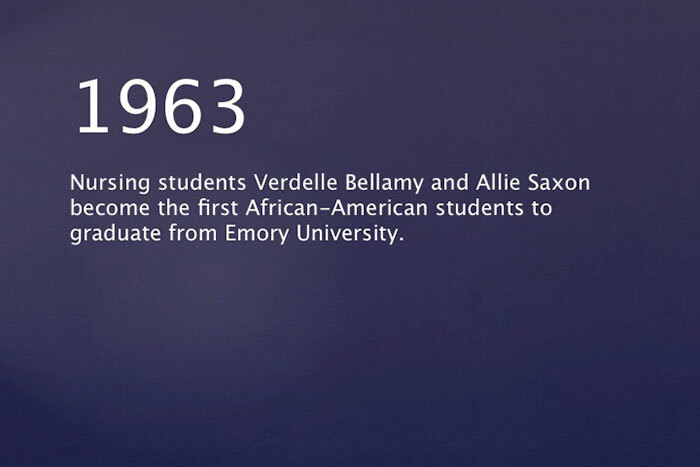 For Emory’s earliest female scholars, it undoubtedly helped to have a campus connection. 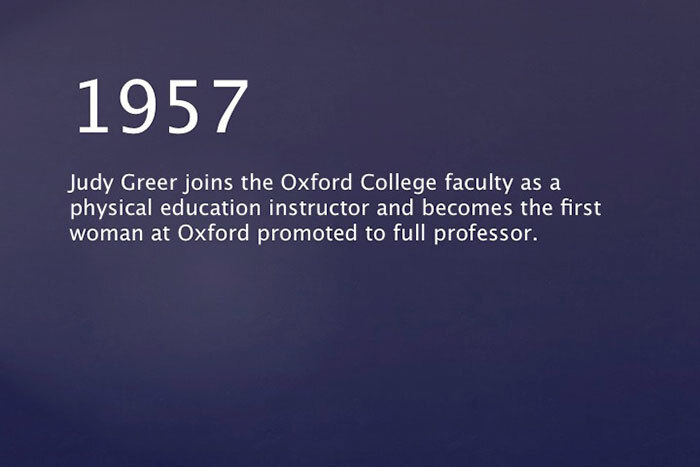 But over the years, the doors to coeducation were also pried open by changing cultural views about women and work. As Emory began to absorb other area professional schools — notably, in nursing and library science — women in those programs were eventually folded into campus life. “Suddenly, you had women grandfathered in as Emory graduates whose degrees at the time weren’t from Emory — nurses and librarians who had connections to the university long before Eléonore Raoul,” he says. Throughout the 1920s and 1930s, it wasn’t uncommon to find women permitted to study at Emory under special circumstances. Teachers seeking professional development during their summer break were allowed to enroll during the summer quarter — in fact, many earned degrees that way. Women were also accepted into graduate and professional schools in small numbers, Bence explains. 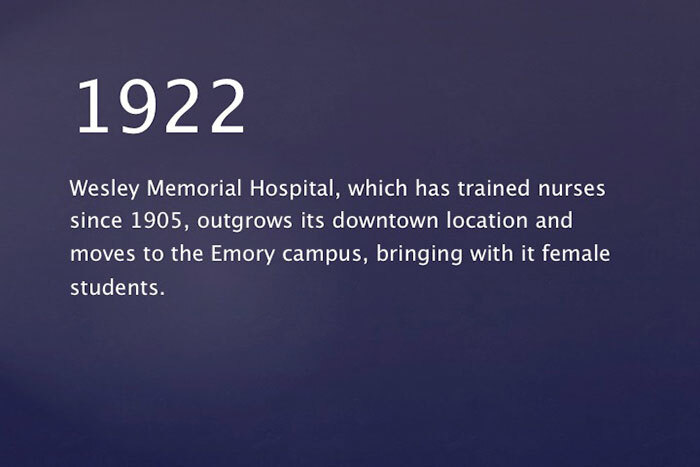 In 1922, Wesley Memorial Hospital, which had trained area nurses since 1905, moved to the Emory campus, bringing a new wave of female students. When they graduated, their degrees were initially from Emory University Hospital. 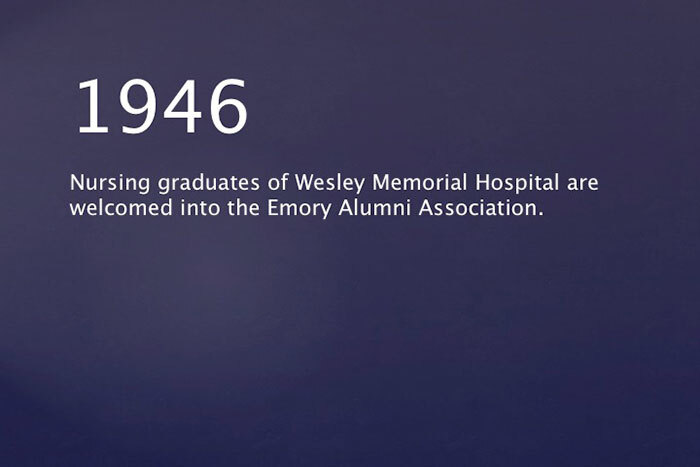 In 1944, the Nursing School became an official school within Emory University; two years later, nursing graduates were welcomed into the Emory Alumni Association, he notes. During World War II and afterward, Emory also saw a surge of women enrolling in the Division of Teacher Education as graduate students. 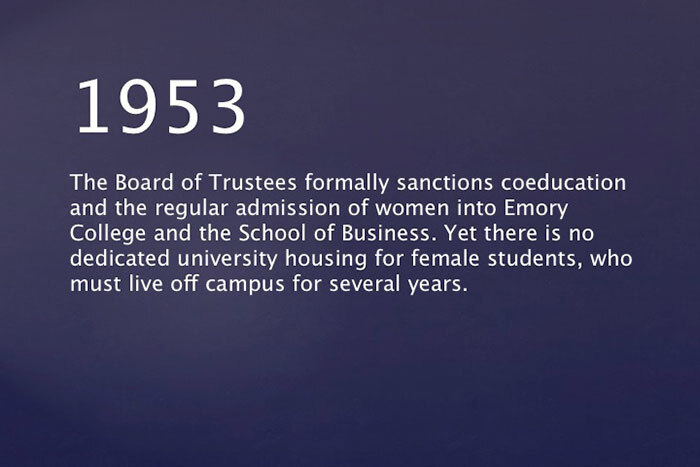 However, throughout the early half of the century, the idea of coeducation at Emory College was largely met with mixed feelings by administrators and trustees — fed in part by a reluctance to compete with Wesleyan and Agnes Scott colleges. It was a struggle mirrored across American higher education. Many of the nation’s private and Ivy League schools wouldn’t go coed until the 1960s and 1970s, according to Bence. Ironically, by the time Emory trustees approved the regular admission of women into Emory College and the School of Business, it is estimated that some 200 bachelor’s degrees had already been awarded to women through Emory College. If it all sounds a bit confusing, that’s because it was. 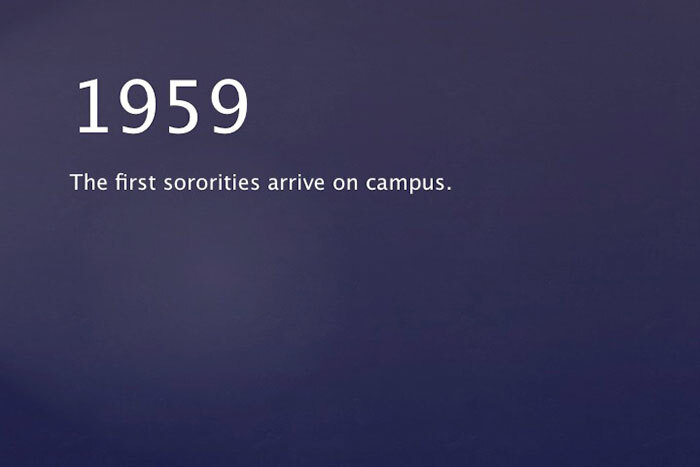 In a 1953 interview, University Vice President J. Gordon Stipe — Emory’s registrar from 1919 to 1938 and director of admissions from 1938 to 1948 — acknowledged that the policy of admitting women had varied so widely from year to year that even he was uncertain what the current policy was at any given time. For instance, at one time coeds were accepted only if they were preparing themselves to teach. At another time, the daughters of faculty members could attend the college a full four years. At other times, admission was allowed only after coeds had taken their first two years of college work elsewhere. At one point, female students other than faculty daughters were admitted to the upper divisions of the college, but only if they lived with their parents or in the homes of nearby relatives. Some were accepted only if they were able to convince Emory President Harvey W. Cox, (1920-1942) that they were serious students. 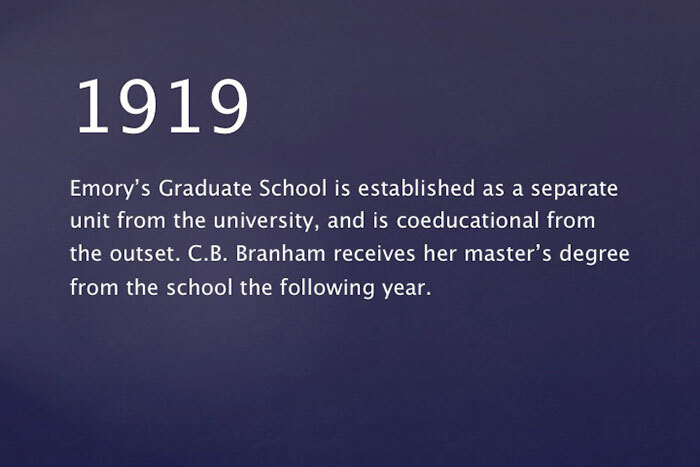 Records show women were receiving master’s degrees from the Emory Graduate School as early as 1920 — a separate unit of the university, it had admitted women since its founding in 1919. 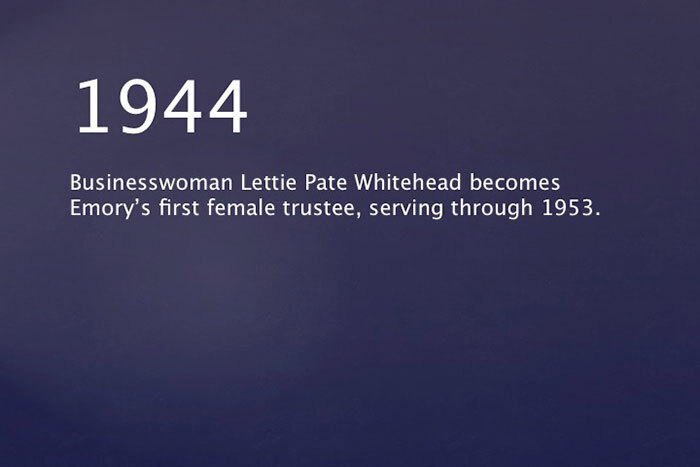 And while it was never an outright policy of the School of Business Administration to accept female students, three had earned degrees in the mid 1930s, according to The Emory Alumnus. 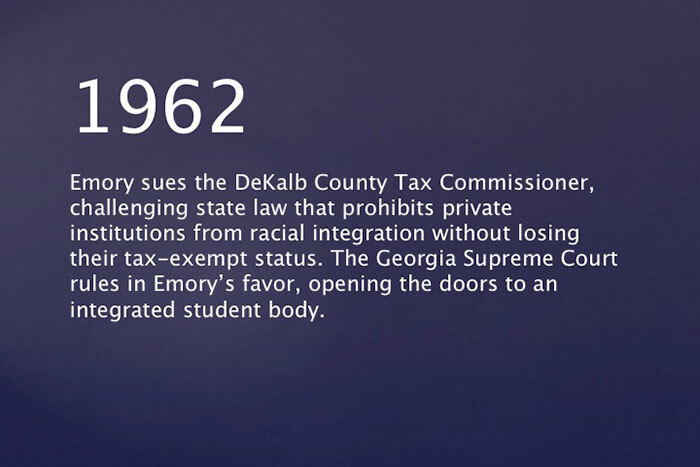 Full integration of the student body would take another decade, when Emory argued a legal case before the Georgia Supreme Court, successfully challenging a law that prohibited private institutions from racial integration with the threat of losing their tax-exempt status. The Georgia Supreme Court ruled in Emory’s favor. In fact, the university’s first African American graduates were women, Hauk notes. One of the photographs in the Rose Library exhibit shows School of Nursing students Verdelle Bellamy 63N and Allie Saxon 63N marching in Emory’s 1964 Commencement procession, having completed their programs the previous winter. 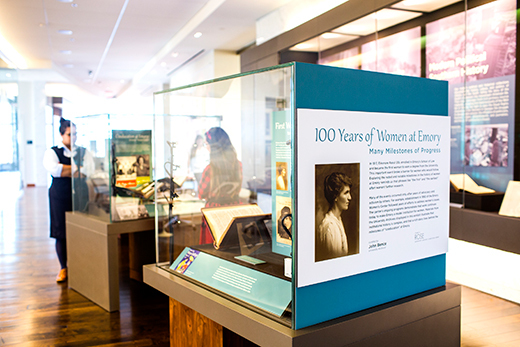 "100 Years of Women at Emory: Many Milestones of Progress" is on display in the Rose Library. It was one thing to educate female students. But hiring women as educators would prove yet another hurdle. And much like the quest for a fully coeducational student population, the practice of hiring female faculty happened gradually, with gains seen first in Emory’s professional schools. 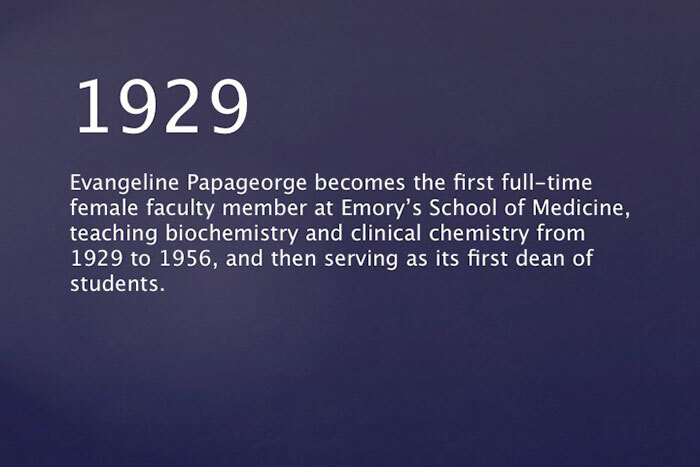 One of the earliest recorded hires was in 1929, when Evangeline Papageorge was employed as the first full-time female faculty member in the School of Medicine, where she taught biochemistry and clinical chemistry for 27 years, then served as its first dean of students for 19 years. “It wasn’t just that Emory had problems integrating women, it was a struggle being seen across higher education,” notes Martha Albertson Fineman, Robert W. Woodruff Professor of Law at the Emory School of Law, founding director of the Feminism and Legal Theory Project, and an authority on feminist jurisprudence. 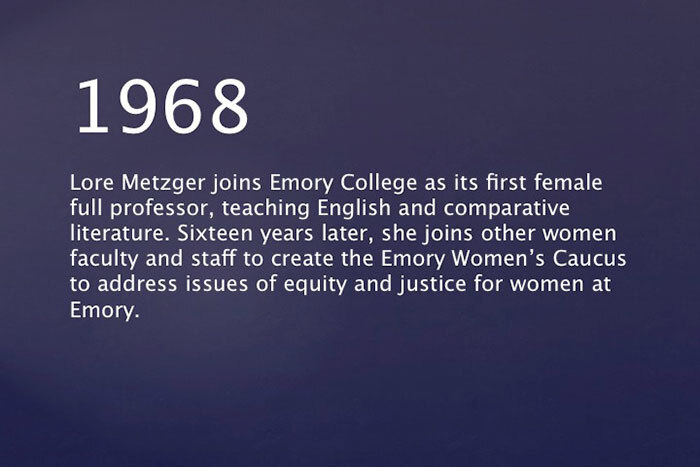 In 1968, Lore Metzger would become the first woman hired as a full professor in Emory College, where she taught English and comparative literature. 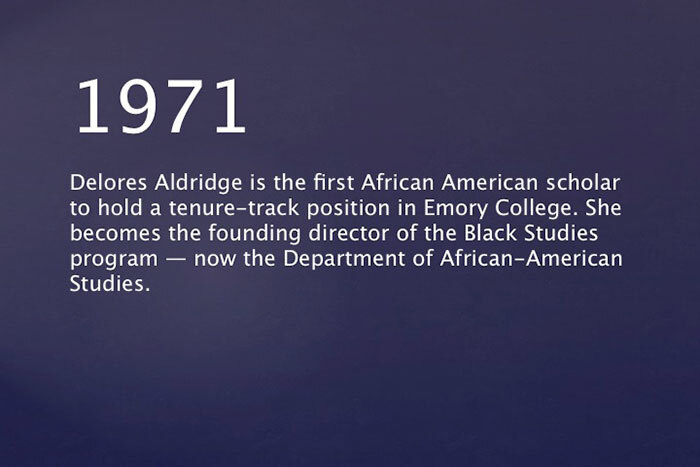 Three years later, Delores Aldridge would become the first African-American scholar to hold a tenure-track position in Emory College, going on to become the founding director of the Black Studies Program, now Emory’s Department of African American Studies. Metzger was also among four faculty members who called an open meeting of women interested in addressing issues of equity and justice for women at Emory. 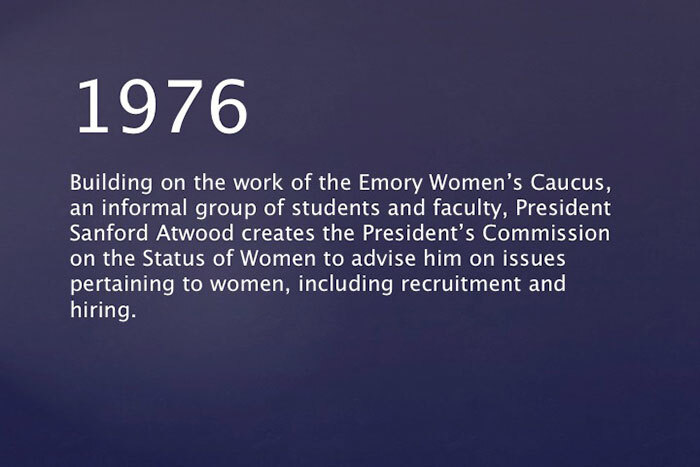 That gathering would lead to the formation of the Emory Women’s Caucus, a pivotal force for campus change. 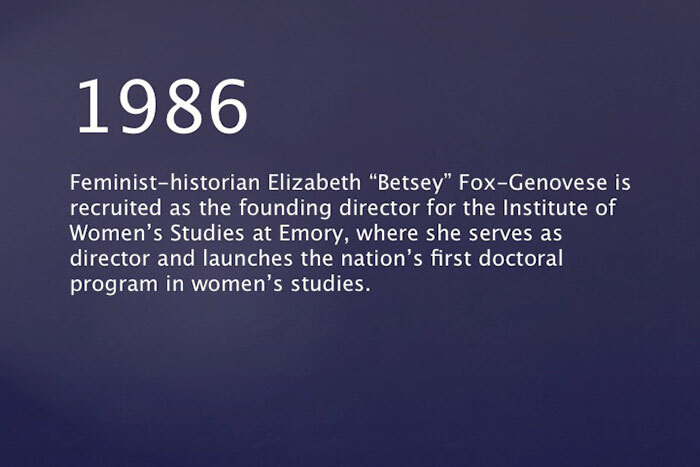 Their foundational work would also lead to the development of the Women’s Studies Program at Emory. Their first agenda item? “At the time, Emory’s affirmative action policy did not mention women,” recalls Hahn, Charles Howard Candler Professor of Educational Studies emeritus. The work of the Emory Women’s Caucus would be a game changer, challenging university policies — or the lack thereof — and leading to new practices in the hiring and treatment of faculty, tenure and promotion, sexual harassment, and the eventual creation of a President’s Commission on Women. The work of early female faculty members including Metzger and Dora “Do” Helen Skypek helped create “an important support structure for the rest of us coming here and pioneering the intrusion of women into the university, which was a bit behind the times," she says. The same cultural struggle was being reflected across the nation. “It was a difficult time,” Barlett notes. “There were a lot of ways in which women’s voices were not respected. At College faculty meetings, it was a rare event for women to stand up and speak. No untenured woman would dare it." As of fall 2016, women constituted 42.4 percent of regular full-time faculty and more than half of the student body. Not only can Emory students take classes dedicated to Women’s, Gender and Sexuality Studies, the campus community finds an array of support and resources in the Emory Center for Women, now marking its 25th anniversary. Last summer, the university’s administrative glass ceiling was finally shattered when the Board of Trustees appointed acclaimed public health researcher Claire E. Sterk as Emory’s 20th president. Reflecting on the progress of women at Emory, Martha Fineman notes that when she arrived on campus in 2004, “one of the reasons I was brought here was specifically because of my work in feminist and legal theory." And considering the demographic balance of students at Emory School of Law, where about half of today’s legal scholars are now women, that says something, she observes. Somehow, she imagines, Eléonore Raoul would approve.